Hosa GMP-467 Adaptor DJParts - All Variety of Parts that DJ Needs. Right Angle Stereo 3.5mm (1/8") Female to Stereo 2.5mm Male. 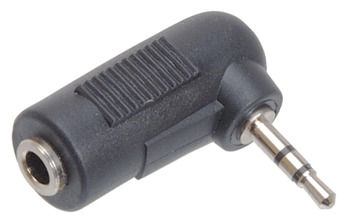 Changes a straight stereo 3.5mm plug into a right-angle 2.5mm plug for situations in which space is limited, or when you need your cable to exit the jack in a certain direction.